An underground Disposal Room in Panel 1 partially filled with drums and Standard Waste Boxes of contact-handled waste. A SWB has four filter ports and at least two filter vents. Ports without filters are plugged during transport. 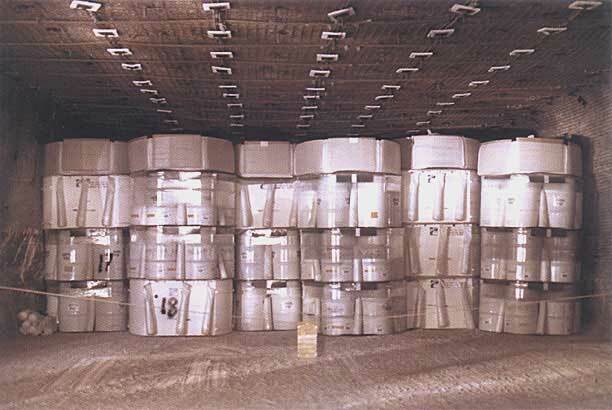 A SWB can hold four 55-gallon drums of waste. Drums are the most common container for TRU waste and are also filtered with at least one filter vent. The drums in this photograph are configured into 7-Packs and wrapped with plastic.